Jacqueline Cochran (May 11, 1906 – August 9, 1980) was an American who pioneered in the field of aviation and one of the most prominent racing pilots of her generation. She was an important contributor to the formation of the wartime Women's Auxiliary Army Corps (WAAC) and Women Airforce Service Pilots (WASP) and was the first woman to break the sound barrier. Jacqueline Cochran, born Bessie Lee Pittman, in Pensacola, (some sources indicate she was born in DeFuniak Springs) in the Florida Panhandle, was the youngest of the five children of Mary (Grant) and Ira Pittman, a skilled millwright who moved from town to town setting up and reworking saw mills. While her family was not rich, Cochran's childhood living in small-town Florida was similar to those in other families of that time and place. Contrary to some accounts, there was always food on the table and she was not adopted, as she often claimed. 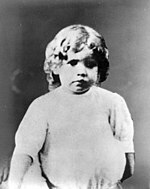 In about 1920, (she would have been 13 or 14), Bessie married Robert Cochran and gave birth to a son, Robert, who died in 1925 at the age of 5. After the marriage ended, Bessie kept the name Cochran and began using Jacqueline or 'Jackie' as her given name. Cochran then became a hairdresser and got a job in Pensacola, eventually winding up in New York City. There, she used her looks and driving personality to get a job at a prestigious salon at Saks Fifth Avenue. Although Cochran denied her family and her past, she remained in touch with them and provided for them over the years. Some of her family even moved to her ranch in California after she remarried. However, they were instructed to always say they were her adopted family. Cochran apparently wanted to hide from the public the early chapters of her life and was successful in doing so until after her death. Only later did Cochran meet Floyd Bostwick Odlum, founder of Atlas Corp. and CEO of RKO in Hollywood. Fourteen years her senior, he was reputed to be one of the 10 richest men in the world. Odlum became enamored of Cochran and offered to help her establish a cosmetics business. After a friend offered her a ride in an aircraft, Cochran began taking flying lessons at Roosevelt Airfield, Long Island in the early 1930s and learned to fly an aircraft in just three weeks. She then soloed and within two years obtained her commercial pilot's license. Odlum, whom she married in 1936 after his divorce, was an astute financier and savvy marketer who recognized the value of publicity for her business. Calling her line of cosmetics Wings to Beauty, she flew her own aircraft around the country promoting her products. Years later, Odlum used his Hollywood connections to get Marilyn Monroe to endorse her line of lipstick. Cochran in the cockpit of a Curtiss P-40 Warhawk. Known by her friends as "Jackie", and maintaining the Cochran name, she was one of three women to compete in the MacRobertson Air Race in 1934. In 1937, she was the only woman to compete in the Bendix race and worked with Amelia Earhart to open the race to women. That year, she also set a new women's national speed record. By 1938, she was considered the best female pilot in the United States. She had won the Bendix and set a new transcontinental speed record as well as altitude records. Cochran was the first woman to fly a bomber across the Atlantic. She won five Harmon Trophies. Sometimes called the "Speed Queen", at the time of her death, no other pilot held more speed, distance, or altitude records in aviation history than Cochran. Before the United States joined World War II, Cochran was part of "Wings for Britain", an organization that ferried American built aircraft to Britain, becoming the first woman to fly a bomber (a Lockheed Hudson V) across the Atlantic. In Britain, she volunteered her services to the Royal Air Force. For several months she worked for the British Air Transport Auxiliary (ATA), recruiting qualified women pilots in the United States and taking them to England where they joined the ATA. Cochran attained the rank of Flight Captain (equivalent to a Squadron Leader in the RAF or a Major in the U.S. Air Force) in the ATA. That same year, Cochran wrote a letter to Lieutenant Colonel Robert Olds, who was helping to organize the Air Corps Ferrying Command for the Air Corps at the time. (Ferrying Command was originally a courier/aircraft delivery service, but evolved into the air transport branch of the United States Army Air Forces (USAAF) as the Air Transport Command). In the letter, Cochran suggested that women pilots be employed to fly non-combat missions for the new command. In early 1941, Olds asked Cochran to find out how many women pilots there were in the United States, what their flying times were, their skills, their interest in flying for the country, and personal information about them. She used records from the Civil Aeronautics Administration to gather the data. In spite of pilot shortages, Lieutenant General Henry H. "Hap" Arnold was the person who needed to be convinced that women pilots were the solution to his staffing problems. Arnold, Chief of the Air Corps, continued as commanding general of the Army Air Forces upon its creation in June 1941. He knew that women were being used successfully in the ATA in England so Arnold suggested that Cochran take a group of qualified female pilots to see how the British were doing. He promised her that no decisions regarding women flying for the USAAF would be made until she returned. When Arnold asked Cochran to go to Britain to study the ATA, Cochran asked 76 of the most qualified female pilots – identified during the research she had done earlier for Olds – to come along and fly for the ATA. Qualifications for these women were high: at least 300 hours of flying time, but most of the women pilots had over 1,000 hours. Those who made it to Canada found out that the washout rate was also high. A total of 25 women passed the tests and, two months later in March 1942 they went to Britain with Cochran to join the ATA. While Cochran was in England, in September 1942, General Arnold authorized the formation of the Women's Auxiliary Ferrying Squadron (WAFS) under the direction of Nancy Harkness Love. The WAFS began at New Castle Air Base in Wilmington, Delaware, with a group of female pilots whose objective was to ferry military aircraft. Hearing about the WAFS, Cochran immediately returned from England. Cochran's experience in Britain with the ATA convinced her that women pilots could be trained to do much more than ferrying. Lobbying Arnold for expanded flying opportunities for female pilots, he sanctioned the creation of the Women's Flying Training Detachment (WFTD), headed by Cochran. In August 1943, the WAFS and the WFTD merged to create the Women Airforce Service Pilots (WASP) with Cochran as director and Nancy Love as head of the ferrying division. As director of the WASP, Cochran supervised the training of hundreds of women pilots at the former Avenger Field in Sweetwater, Texas from August 1943 to December 1944. At war's end, Cochran was hired by a magazine to report on global postwar events. In this role, she witnessed Japanese General Tomoyuki Yamashita's surrender in the Philippines and was then the first non-Japanese woman to enter Japan after the War and attended the Nuremberg Trials in Germany. On September 9, 1948, Cochran joined the U.S. Air Force Reserve as a lieutenant colonel. She was promoted to colonel in 1969 and retired in 1970. She was, quite probably, the first woman pilot in the United States Air Force. During her career in the Air Force Reserve, she received three awards of the Distinguished Flying Cross for various achievements from 1947 to 1964. Postwar, Cochran began flying the new jet aircraft, going on to set numerous records; most conspicuously, she became the first woman pilot to "go supersonic". Among her many record accomplishments, from August to October 1961, as a consultant to Northrop Corporation, Cochran set a series of speed, distance and altitude records while flying a Northrop T-38A-30-NO Talon supersonic trainer, serial number 60-0551. On the final day of the record series, she set two Fédération Aéronautique Internationale (FAI) world records, taking the T-38 to altitudes of 55,252.625 feet (16,841 meters) in horizontal flight and reaching a peak altitude of 56,072.835 feet (17,091 meters). Cochran was also the first woman to land and take off from an aircraft carrier, the first woman to pilot a bomber across the North Atlantic (in 1941) and later to fly a jet aircraft on a transatlantic flight, the first pilot to make a blind (instrument) landing, the only woman ever to be president of the Fédération Aéronautique Internationale (1958–1961), the first woman to fly a fixed-wing, jet aircraft across the Atlantic, the first pilot to fly above 20,000 feet (6,096 meters) with an oxygen mask, and the first woman to enter the Bendix Transcontinental Race. She still holds more distance and speed records than any pilot living or dead, male or female. Because of her interest in all forms of aviation, Cochran flew the Goodyear Blimp in the early 1960s with Goodyear Blimp Captain R. W. Crosier in Akron, Ohio. In the 1960s, Cochran was a sponsor of the Mercury 13 program, an early effort to test the ability of women to be astronauts. Thirteen women pilots passed the same preliminary tests as the male astronauts of the Mercury program before the program was cancelled. [N 2] It was never a NASA initiative, though it was spearheaded by two members of the NASA Life Sciences Committee, one of whom, William Randolph Lovelace II, was a close friend of Cochran and her husband. Though Cochran initially supported the program, she was later responsible for delaying further phases of testing, and letters from her to members of the Navy and NASA expressing concern over whether the program was to be run properly and in accordance with NASA goals may have significantly contributed to the eventual cancellation of the program. It is generally accepted that Cochran turned against the program out of concern that she would no longer be the most prominent female aviator. Significantly, the hearings investigated the possibility of gender discrimination a two full years before the Civil Rights Act of 1964 made that illegal, making these hearings a marker of how ideas about women's rights permeated political discourse even before they were enshrined in law. A lifelong Republican, Cochran, as a result of her involvement in politics and the military, would become close friends with General Dwight Eisenhower. In the early part of 1952, she and her husband helped sponsor a large rally at Madison Square Garden in New York City in support of an Eisenhower presidential candidacy. The rally was documented on film and Cochran personally flew it to France for a special showing at Eisenhower's headquarters. Her efforts proved a major factor in convincing Eisenhower to run for President of the United States in 1952 and she would play a major role in his successful campaign. Close friends thereafter, Eisenhower frequently visited her and her husband at their California ranch and after leaving office, wrote portions of his memoirs there. Politically ambitious, Cochran ran for Congress in 1956 from California's 29th Congressional District as the candidate of the Republican Party. Her name appeared throughout the campaign and on the ballot as Jacqueline Cochran-Odlum. Although she defeated a field of five male opponents to win the Republican nomination, in the general election she lost a close election to Democratic candidate and first Asian-American congressman Dalip Singh Saund. Saund won with 54,989 votes (51.5%) to Cochran's 51,690 votes (48.5%). Her political setback was one of the few failures she ever experienced and she never attempted another run. Those who knew Cochran have said that the loss bothered her for the rest of her life. Cochran died on August 9, 1980 at her home in Indio, California that she shared with her husband until he had died four years prior. She was a long-time resident of the Coachella Valley and is buried in Coachella Valley Public Cemetery. She regularly utilized Thermal Airport over the course of her long aviation career. The airport, which had been renamed Desert Resorts Regional, was again renamed Jacqueline Cochran Regional Airport in her honor. Cochran's aviation accomplishments never gained the continuing media attention given those of Amelia Earhart. Also, Cochran's use of her husband's immense wealth reduced the rags-to-riches nature of her story. Nonetheless, she deserves a place in the ranks of famous women aviators and as a woman who frequently used her influence to advance the cause of women in aviation. Despite her lack of formal education, Cochran had a quick mind and an affinity for business and her investment in the cosmetics field proved a lucrative one. Later, in 1951, the Boston Chamber of Commerce voted her one of the 25 outstanding businesswomen in America. In 1953 and 1954, the Associated Press named her "Woman of the Year in Business". Blessed by fame and wealth, Cochran donated a great deal of time and money to charitable works. For exceptionally meritorious service to the Government in a position of great responsibility from June 1943 to December 1944 as Director of Women Pilots, Headquarters Army Air Forces. She directed the planning, programming and administration or all women pilot activities of the Army Air Forces, including the organization, training and operation of the Women Airforce Service Pilots (WASP). Under her leadership the WASP performed with the utmost loyalty and efficiency, multiple flying services, in direct and effective support of the Army Air Forces which were of the greatest assistance and support to the war effort and the nation. Further, her achievements in this respect and the conclusions she has carefully and wisely drawn from this undertaking represent a contribution which is of permanent and far-reaching significance to the future of aviation. Her vision, skill and initiative have resulted in services of exceptional value and importance to the country. The President of the United States of America, authorized by Act of Congress, July 2, 1926, takes pleasure in presenting the Distinguished Flying Cross to Colonel Jacqueline Cochran, United States Air Force, for extraordinary achievement while participating in aerial flight from 1947 to 1951. During this period, Colonel Cochran piloted an F-51 aircraft in which she established six world speed records. At Coachella Valley, California, flying a closed-circuit 100-kilometer course, Colonel Cochran established a new speed record of 469.549 miles per hour. In other flights from Thermal, Indio, and Palm Springs, CA, Colonel Cochran established world speed records for the 3-, 15-, 500-, 1000-, and 2000-kilometer courses. The professional competence, aerial skill, and devotion to duty displayed by Colonel Cochran reflect great credit upon herself and the United States Air Force. The President of the United States of America, authorized by Act of Congress, July 2, 1926, takes pleasure in presenting a Bronze Oak Leaf Cluster in lieu of a Second Award of the Distinguished Flying Cross to Colonel Jacqueline Cochran, United States Air Force, for extraordinary achievement while participating in aerial flight during April 1962. During that period, Colonel Cochran established a number of world records on a flight from New Orleans, LA to Bonn, Germany. Flying a Lockheed Jet Star C-140 Colonel Cochran established 69 intercity, intercapital, and straight-line distance records and routes, in addition to becoming the first woman to fly a jet aircraft across the Atlantic Ocean. The records were for both speed and distance. The professional competence, aerial skill, and devotion to duty displayed by Colonel Cochran reflect great credit upon herself and the United States Air Force. The President of the United States of America, authorized by Act of Congress, July 2, 1926, takes pleasure in presenting a Second Bronze Oak Leaf Cluster in lieu of a Third Award of the Distinguished Flying Cross to Colonel Jacqueline Cochran, United States Air Force, for extraordinary achievement while participating in aerial flight during May and June 1964. During this period, Colonel Cochran established three world speed records in an F-104C Starfighter. Flying a precise circular course, Colonel Cochran set a 25-kilometer record of 1429.297 miles per hour, more than twice the speed of sound. She established a record for the 100-kilometer course by flying at 1302 miles per hour. Colonel Cochran established a third world's speed record by achieving 1135 miles per hour over a 500-kilometer course. The professional competence, aerial skill, and devotion to duty displayed by Colonel Cochran reflect great credit upon herself and the United States Air Force. From many countries around the world, Cochran received citations and awards. In 1949, the government of France recognized her contribution to the war and aviation awarding her in 1951 with the French Air Medal. She is the only woman to ever receive the Gold Medal from the Fédération Aéronautique Internationale. She would go on to be elected to that body's board of directors and director of Northwest Airlines in the U.S. At home, the Air Force awarded her the Distinguished Flying Cross and the Legion of Merit. In 1949, Cochran became the fourth U.S. recipient of the Türk Hava Kurumu's (Turkish Aeronautical Association) highest award, the Murassa Brövesi (Diamond Brevet). An annual air show called the Jacqueline Cochran Air Show is named in her honor and takes place at the Jacqueline Cochran Regional Airport. Cochran also became the first woman to be honored with a permanent display of her achievements at the United States Air Force Academy. In the play The Fastest Woman Alive, written by Karen Sunde, Cochran's life is chronicled alongside her husband, Floyd, Amelia Earhart, and others. 1993, induction into the National Women's Hall of Fame. 1996, the United States Post Office honored Cochran with a 50¢ postage stamp, depicting her in front of a Bendix Trophy pylon with her P-35 in the background and the words: "Jacqueline Cochran Pioneer Pilot"
2002, induction into the Georgia Aviation Hall of Fame. ^ During her supersonic run, Yeager flew right on her wing. ^ Scott Carpenter remarked that "a woman would exceed our weight allowance for recreational equipment." ^ a b c d e f g h "Jacqueline Cochran and the Women's Airforce Service Pilots." National Archives and Records Administration: The Dwight D. Eisenhower Presidential Library, Museum, and Boyhood Home. Retrieved: July 10, 2013. ^ a b Hickok, Ralph, "The Encyclopedia of North American Sports History", Facts On File, Inc., New York, Oxford,1992, Library of Congress card number 91-6667, ISBN 0-8160-2096-5, page 110. ^ Nolen 2002, pp. 32, 34. ^ "Robert Cochran" Retrieved: May 20, 2015. ^ "Jackie Cochran: American Athena, Part I | Capitalism Magazine". www.capitalismmagazine.com. Retrieved 2018-02-26. ^ "Jacqueline Cochran: American Athena, Part II | Capitalism Magazine". www.capitalismmagazine.com. Retrieved 2018-02-26. ^ "Apply for a Trademark. Search a Trademark". trademarkia.com. Retrieved 2018-02-26. ^ Cavanaugh, Jack (2006). The Victors. David C Cook. ISBN 9781589190719. ^ "Jacqueline Cochran." Britannica Online Encyclopædia. Retrieved: July 10, 2013. ^ [email protected] "Cosmetics and Skin: Shulton". www.cosmeticsandskin.com. Retrieved 2018-02-26. ^ "ETF Enterprises, Inc. v. Nina Ricci, 523 F. Supp. 1147 (S.D.N.Y. 1981)". Justia Law. Retrieved 2018-02-26. ^ Shapiro, Eben (1989-12-28). "Talking Deals; Drug Companies Leave Cosmetics". The New York Times. ISSN 0362-4331. Retrieved 2018-02-26. ^ Ress, Paul. "SWEET EXPLOSION IN THE AIR". SI.com. Retrieved 2018-02-26. ^ "Explorers, Record Setters and Daredevils." Archived 2008-03-02 at the Wayback Machine Centennial of Flight, 2003. Retrieved: October 24, 2009. ^ Cochran 1954, pp. 125–128. ^ "FLYING FOR FREEDOM - The Story of the Women Airforce[sic] Service Pilots (Teacher Resource Guide)" (PDF). NATIONAL MUSEUM of the United States Air Force. Retrieved 2018-02-27. ^ "AUDIOVISUAL TRANSCRIPTS (Early Years Gallery)" (PDF). NATIONAL MUSEUM of the United States Air Force. Retrieved 2018-02-27. ^ "Photos". www.nationalmuseum.af.mil. Retrieved 2018-02-26. ^ "Museum celebrates Women's History Month". National Museum of the US Air Force™. Retrieved 2018-02-26. ^ "Museum celebrates women during 'Women's History Month'". National Museum of the US Air Force™. Retrieved 2018-02-27. ^ "WASP: Breaking Ground for Today's Female USAF Pilots". National Museum of the US Air Force™. Retrieved 2018-02-27. ^ "WASP Created". National Museum of the US Air Force™. Retrieved 2018-02-27. ^ "Women's Flying Training Detachment". National Museum of the US Air Force™. Retrieved 2018-02-27. ^ "They Raced for the Bendix Trophy". National Museum of the US Air Force™. Retrieved 2018-02-27. ^ "WASP Creation". National Museum of the US Air Force™. Retrieved 2018-02-27. ^ Cochran 1954, p. 108. ^ Regis 2008, pp. 102–103. ^ "Press Release: Jacqueline Cochran - Pearl Harbor Filing Cabinet - Liberty Letters". libertyletters.com. Retrieved 2018-02-27. ^ a b c "Jacqueline Cochran." U.S. Air Force.. Retrieved: July 27, 2009. ^ "Jacqueline Cochran | Biography, Records, & Facts". Encyclopedia Britannica. Retrieved 2018-02-27. ^ Cochran 1954, pp. 241–242. ^ Pelletier 2012, p. 149. ^ Hallonquist, Al. "Mercury 13: The women of the Mercury era." Al Hallonquist, 2012. Retrieved: October 24, 2009. ^ Wilson, Barbara A. "Military women astronauts." Captain Barbara A. Wilson, USAF (Ret). Retrieved: October 24, 2009. ^ "The Space Review: You've come a long way, baby!". www.thespacereview.com. Retrieved 2018-02-27. ^ Ackmann 2003, pp. 152, 154–155. ^ a b Weitekamp, Margaret A. "Lovelace's woman in space program." NASA History Program Office, January 28, 2010. Retrieved: July 10, 2013. ^ https://news.google.com/newspapers?nid=1915&dat=19831004&id=l0RSAAAAIBAJ&sjid=KzYNAAAAIBAJ&pg=3816,773331 The Day. October 4, 1983. Retrieved March 27, 2017. 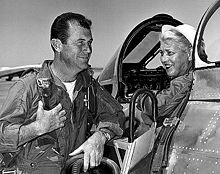 ^ "Press Release – Distinguished Service Award to Jacqueline Cochran". Liberty Letters. March 1, 1945. Retrieved 2018-02-27. ^ "The Fastest Woman Alive". Archived 2007-10-27 at the Wayback Machine Dramatic Publishing, 2009. Retrieved: July 10, 2013. ^ "Jacqueline "Jackie" Cochran". Georgia Aviation Hall of Fame. Retrieved October 9, 2018. Ackmann, Martha. The Mercury 13: The Untold Story of Thirteen American Women and the Dream of Space Flight. New York: Random House, 2003. ISBN 978-0-375-50744-1. Carl, Ann Baumgartner. A WASP Among Eagles. Washington, D.C.: Smithsonian Institution, 2000. ISBN 1-56098-870-3. Cochran, Jacqueline. The Stars at Noon. Boston: Little, Brown and Company, 1954, re-issued in 1979. Cochran, Jacqueline and Maryann Bucknum Brinley. Jackie Cochran: The Autobiography of the Greatest Woman Pilot in Aviation History. New York: Bantam Books, 1987. ISBN 0-553-05211-X. McGuire, Nina and Sandra Wallus Sammons. Jacqueline Cochran: America's Fearless Aviator. Lake Buena Vista, Florida: Tailored Tours Publishing, 1997. ISBN 0-9631241-6-1. Merryman, Molly. Clipped Wings: The Rise and Fall of the Women Air Force Service Pilots (WASPs) of World War II. New York: New York University Press, 1998. ISBN 0-8147-5567-4. Nolen, Stephanie. Promised The Moon: The Untold Story of the First Women in the Space Race. Toronto, Canada: Penguin Canada, 2002. ISBN 1-56858-275-7. Pelletier, Alain.High-Flying Women: A World History of Female Pilots. Sparkford, UK: Haynes, 2012. ISBN 978-0-85733-257-8. Reminiscences of Jacqueline Cochran. Columbia University Aviation Project. New York: Columbia University Oral History Research Office, 1961. Sprekelmeyer, Linda, editor. These We Honor: The International Aerospace Hall of Fame. Donning Co. Publishers, 2006. Sunde, Karen. The Fastest Woman Alive. Woodstock, Illinois: Dramatic Publishing, 2005. ISBN 978-1-58342-273-1. Williams, Vera S. WASPs: Women Air Force Service Pilots of World War II. St. Paul, Minnesota: Motorbooks International, 1994. ISBN 0-87938-856-0. Wikimedia Commons has media related to Jacqueline Cochran. Robinson, Erik Thomas. "Cochran, Jacqueline (1910?–09 August 1980), pioneer aviator and business executive". American National Biography. doi:10.1093/anb/9780198606697.001.0001/anb-9780198606697-e-2001290.